Potato soup is a perfect meal when it's cold outside, when you're feeling down in the dumps, or when you want a classic comfort meal. These recipes will quickly warm you up and leave you feeling satisfied. We suggest you try one of these 8 Hearty Potato Soup Recipes as soon as possible. You'll wonder why it took you so long to find these easy gluten free recipes. But don't worry; now that you have these potato soup recipes, you can save them in your recipe book. Then you'll have a delicious potato soup recipe on hand for whenever you need one. These easy gluten free recipes would be perfect for fall or winter, but there's nothing stopping you from enjoying them all year long. So go ahead and make one of these soups for tonight's dinner! Warm up with one of these easy potato soup recipes. Made in our test kitchen, this is a tried-and-true recipe that everyone will love. The touch of bacon takes this potato soup recipe to the next level. When you need to be comforted, try this baked potato soup. You can choose which toppings to include such as sour cream, carrots, bacon, green onions, or an extra dash of pepper. This clam chowder recipe will taste exactly like your grandma's old-fashion recipe. You can't go wrong with this hearty recipe. After trying this chowder recipe for the first time, you'll be hooked! It's hard to imagine that this recipe sneaks in so many healthy veggies. 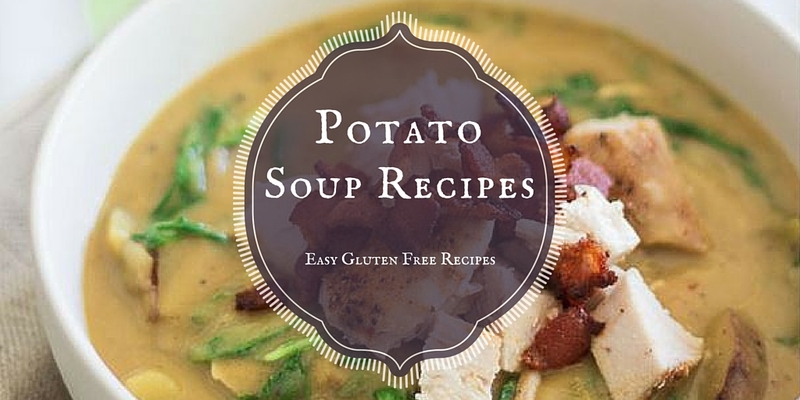 For even more gluten free soup recipes, check out these 25+ Simple Soup Recipes. This is the ultimate creamy potato soup recipe. The best news is that this gluten free recipe requires only 15 minutes of prep time. We suggest you serve this satisfying potato soup recipe with gluten free bread. Oh and did we mention that this is an easy vegan recipe? You've probably never seen a recipe like this one! We promise that you'll fall in love almost instantly. Yum, Yum, Yum. This stew is absolutely, without a doubt, amazing! We suggest you make this gluten free recipe for tonight's dinner. Fresh bread and warm soup is a classic combination. With this Gluten Free Bread eCookbook, you can make your own homemade bread!